Duras’ recipes illustrate how cooking—like literature, like memory—is a subjective experience in a continual state of being perfected. The prolific French writer and filmmaker Marguerite Duras is perhaps best known for her novel The Lover, winner of the 1984 Prix Goncourt, as well as for her 1959 Oscar-nominated screenplay Hiroshima mon amour. In 1987, she published a collection of texts entitled La vie matérielle (Practicalities), in which she relates “everything and nothing” relating to her life, from her work to everyday thoughts. Duras was an avid cook and had intended to include some of her recipes in the collection, too. Ultimately, though, while some recipes made it into La vie matérielle, most did not. 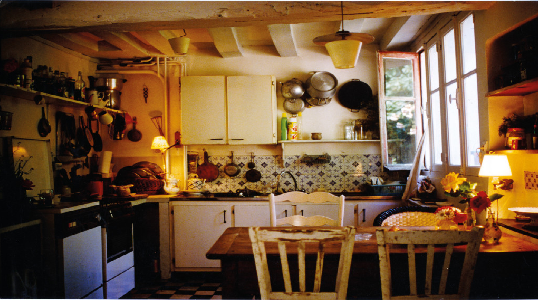 After Duras’s death in 1996, her son Jean Mascolo sought to rectify this by publishing the slim volume La Cuisine de Marguerite (Benoît Jacob), a collection of his mother’s recipes as recorded in her handwritten notebook. After a false start in 1999 when Duras’s literary executor blocked its sale, the book was finally republished and circulated in 2014. Among the most personal recipes in the book are those originating from the place of Duras’s birth in 1914: the Gia Định province in French Indochina, near what is now known as Ho Chi Minh City, Vietnam. Duras was the middle child and only daughter of two schoolteachers who had answered the French colonial government’s call for volunteers. Her father died early on, plunging the family into poverty, after which her mother allowed the children near-complete freedom. Unlike the other colonists, the siblings were allowed to play with Vietnamese children, and Duras spoke fluent Vietnamese. She had no taste for French foods—the Normandy apples and the meat that her mother occasionally served the family—preferring rice, soups from street vendors, and fresh fish cooked in nuoc-mâm, Vietnamese fish sauce.